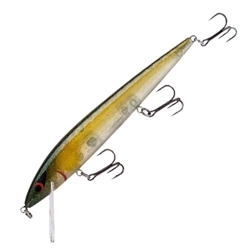 The Smithwick Elite 8 Rogue dives quickly to 8 feet deep and features erratic panicked darts to the side when twitched. Color patterns include both translucent versions for clear water and bright chrome and gold versions for colored water and for a variety of light conditions. The Elite 8 features a loud internal tungsten rattle and that classic "Rogue Roll" that has caught so many bass in the past and made the Rogue the jerkbait of choice. This series Rogue is suspending, dives 6-8', and 1/2oz with a 4-1/2" body length.